It's been over three weeks since I've managed to get a post up; partly because I was so busy with work and uni and partly because I was finalizing everything for my trip. We've finally got this show on the road and I'm in Istanbul, the largest city in Turkey! Turkey is a predominantly Muslim country and so I always knew the beer selection would be limited, never did I expect it would be this limited! From what I've gathered Efes is one of very few producers of beer in the country and seemingly only their products are accessible to tourists. The above photo is what I could gather from near my hotel and what I'm going to use to review Turkey (or more accurately Efes') beer range. Like most Western countries lager is the mainstay of the Turkish beer drinker. 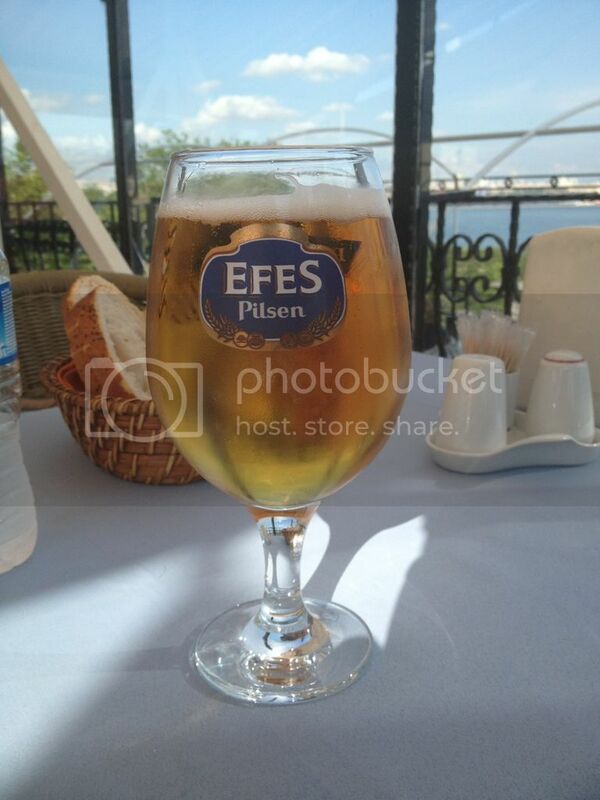 Efes Pilsen is the lager of choice and dominates the market with about 70% of all beer sales in Turkey! The first one I had after arrival was quite drinkable, the second was bearable due to it being so hot outside and being on a rooftop terrace overlooking the Bosphorus but that was where it ended! The pour is average, the smell is average and the flavour is too sweet to be deemed a Pilsner. Thankfully for me some of Efes' other products are of a higher standard. Efes Ustisindan Fici is a better example of the normal Efes Pilsen. It has been designed to taste for like the draft version of the beer, which incidentally is much better to drink! Both the bottle and can are designed to look like kegs/barrels of beer. Both bottle and can form taste fresher and crisper than standard Efes Pilsen. Efes Unfiltered was a real bolt from the blue. I tried it between two of the worst macro swill lagers you will ever try and it really impressed. As expected a cloudy beer emerged when I cracked the can and poured it into my Efes glass. The aroma was average but the flavour had some hops and more importantly some flavour! I'm going to have to find another one of these to check but I'm pretty sure it was good, not just the best of a bad lot. I thought after having the Efes Unfiltered on my second last day in Istanbul that I had found the best beer I would have in Turkey, but I was wrong! 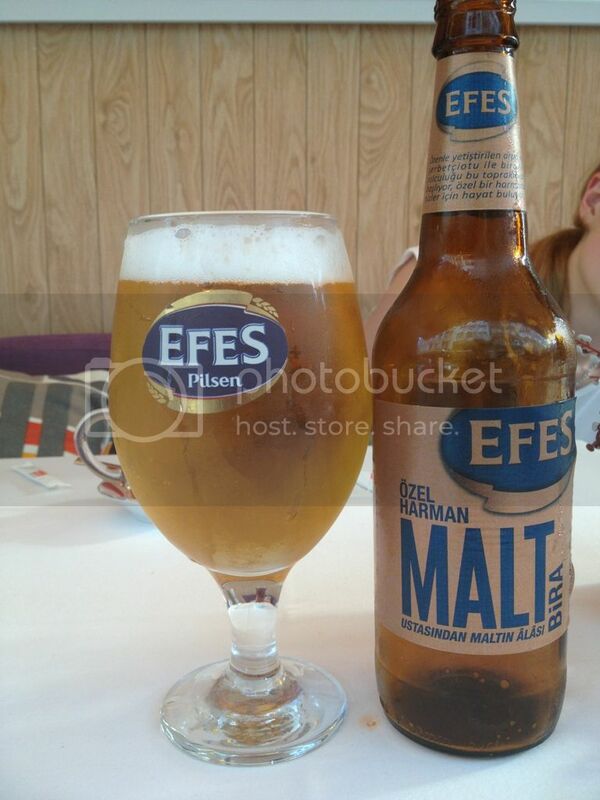 Efes Malt was a far superior beer, which I should also add came with a far heftier price tag. There were some real hops, both grassy and spicy, coupled nicely with a balanced malt body. Also this beer had some lacing and head retention, a characteristic missing in all other Turkish beers I've sampled so far on this trip. 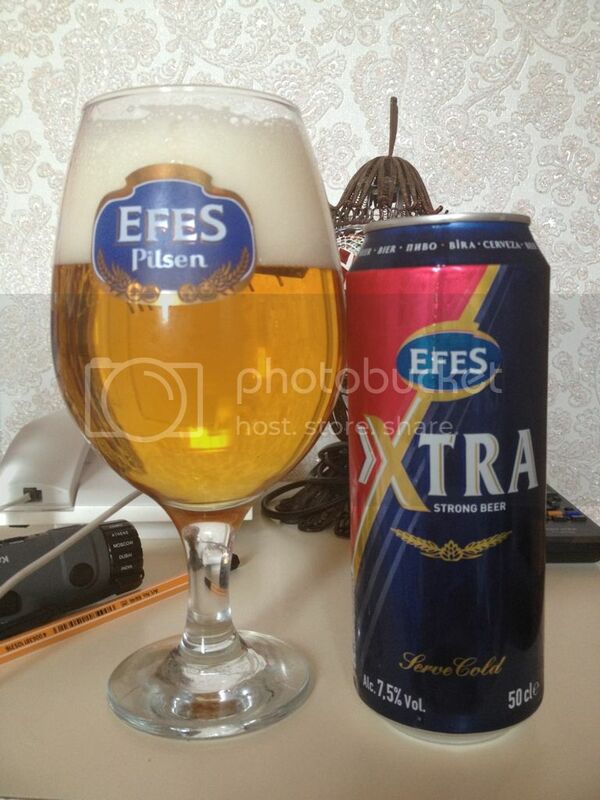 Excluding the standard Efes Pilsen the beer I most commonly see locals drinking is Efes Xtra. After trying it I can only assume that a) the locals are idiots or b) these particular locals are allergic to Raki. Why would anyone drink this terrible excuse for a beer when Raki (the local spirit at around 55% ABV) costs not much more than a can of this rubbish! It was so bad I couldn't finish it! Far too sweet and far too much raw alcohol, it was just terrible! Not even worth drinking to get drunk on! On my last day in Turkey I had two beers to finish off my Turkish beer experience; Bomonti and Efes Dark. Bomonti followed the trend of the other lagers, pretty basic flavour with some initial promise fading to nothing. In stark comparison Efes Dark provided some light to an otherwise dreary Turkish beer scene. For a Euro Dark Lager it really stood out with excellent drinkability not getting in the way of flavour. Coffee and caramel malts were complimented by clever use of hops. In all honesty Turkey's beer scene was horrendous! Boring macro lager followed by boring macro lager on the whole, and to top it all off they are made by the same brewery! When one brewery has almost total control of a countries beer production results are never going to be good. Efes Malt, for lager drinkers, and Efes Dark, for those who can handle the dark stuff, were the two standouts with a special mention to Efes Unfiltered which is also a very solid beer.